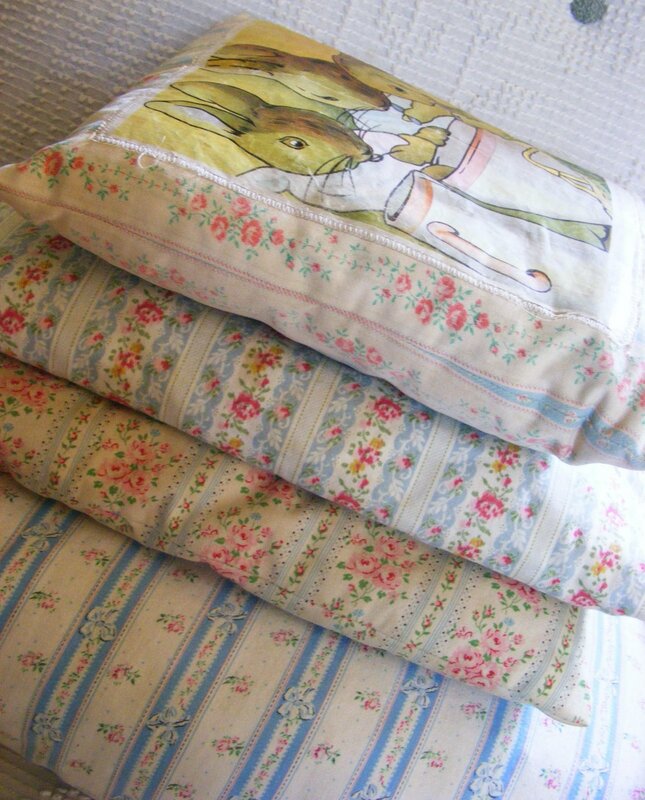 My little vintage pillow collection is growing. Last week I found the 2 middle pillows (baby size) @ an Estate Sale with Jeanetta. Times like this, it comes in handy that I love lots of things that other people seem to look right past. 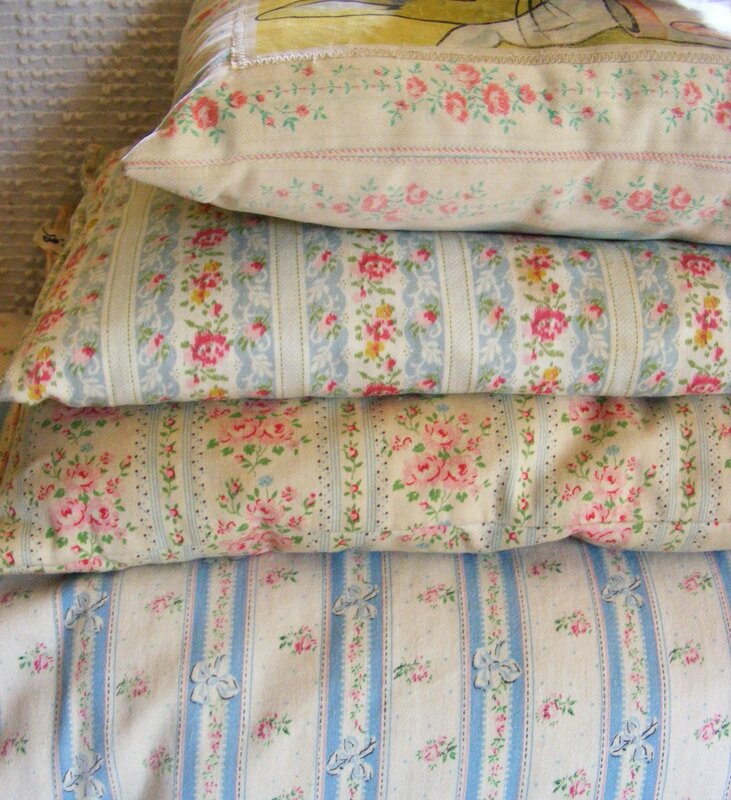 How could anyone not love these vintage feather pillows with the floral pillow ticking fabric? 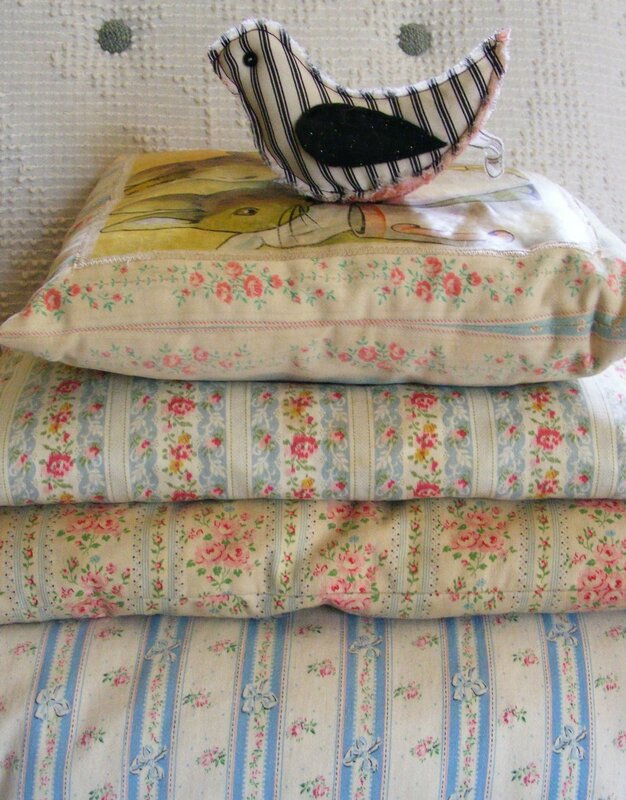 Love the vintage pillows.. and feather pillows? I can’t understand why anyone would get rid of those either.. Yet, they are your’s to treasure.. I love your cute kitchen at different stages and homes.. You definitely have the decorating touch.I love the Aqua that is so popularagain now.. Also, I did enjoy the Camp Storia.. It has been too busy around here but, I have the archives so I will enjoy finishing everything when I have the time.. I think it was a very creative and original idea.. You did awesome!! <>We<> would have had to fight over those, LOL.Love those fabrics! And feather pillows?! Nice find. oh, I had a baby pillow made from the same ticking as the top pillow. It was a feather pillow too! My mom had to make me a new one for my 30th birthday because the feathers in the original were turning to dust! Love the bunny pillow. Great pictures! Happy Birthday to your little guy! The birdie was made my best gal pal Jeanetta – you can check her out at http://jeanettadarley.com. She loves to do custom orders!